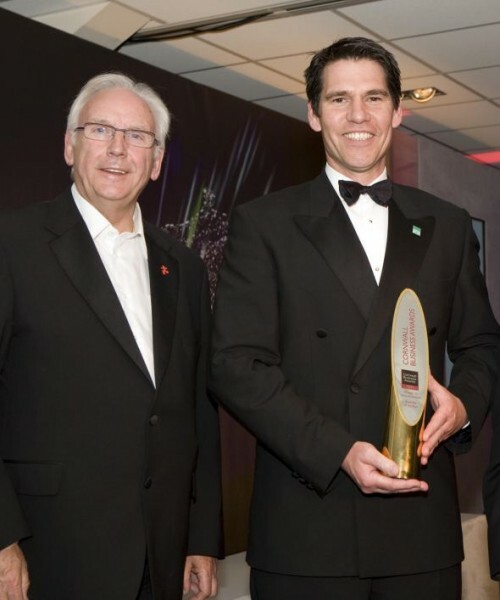 Inspirational founder of Helston-based charity ShelterBox Tom Henderson OBE claimed the coveted “Winner of Winners” mantle at the Cornwall Business Awards 2011. Henderson, whose organisation has already helped people in some 80 countries, had already been named Business Leader of the Year, in recognition of his work building the internationally-renowned charity within the county. He collected his award in a pre-recorded video message that moved the 320-strong capacity audience at St Mellion International Resort, who had enjoyed a colourful keynote speech from music industry mogul Pete Waterman. ShelterBox’s near neighbor Frugi was another big winner; the organic clothing company scoring a hat-trick of awards for Customer Focus (sponsored by Business Cornwall magazine), Best International Business and Most Creative Use of the Web. Scuba equipment specialist Fourth Element completed an excellent night for companies from the Helston area, winning the Best Diversification category for its new method for creating interactive 3D maps of submerged wrecks. Falmouth’s Fit’n’Fun Kids, the childcare company run by two-time Entrepreneur of the Year Rachel Jones, was a double winner again, receiving awards for Best Employer and Excellence in Marketing. This year’s awards also saw an impressive number of first-time winners. 2011’s Entrepreneur of the Year award went to Julie Hewitt of St Wenn-based Rosedown Eggs, for achieving a five-fold improvement in sales. Meanwhile, 26 year-old Dan Parker, who turned his online system for university sports clubs into flourishing mobile messaging firm Firetext Communications, was rewarded with the title Young Businessperson of the Year. Another electronic messaging company, Bude-based Schoolcomms, whose system delivered well over half a million updates to parents each day during December’s extreme weather, won Most Dynamic Growth Business. Cornwall’s burgeoning green sector was in evidence, as Solar farm developer Silicon Vineyard was named Best New Business in Cornwall, while environmental social enterprise ReZolve collected the award for Best Third Sector Business.Technical innovation was also well represented, with an electronic waste transfer record system from Clear-flow winning Best Use of Technology and Launceston-based Acaster Blades receiving Business Innovation of the Year for its super-efficient heating and hot water system. A team from Richard Lander School collected their Young Enterprise Award, while Penryn baby feeding product company Sproggie were welcomed onstage to receive the prize for winning the Ignite Cornwall Business Plan Competition. 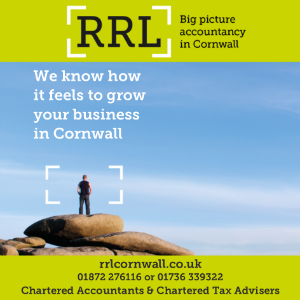 The Cornwall Business Awards are organised by Cornwall Development Company to spotlight the quality and diversity of businesses succeeding in the county. Chief executive Suzanne Bond said: “Tonight’s winners – indeed, all the finalists – have proven once again that Cornwall has the business talent, creativity and determination to take a starring role as the UK emerges from recession.